As this posting goes online, 50-meter NEA 2011 GP59 is closest to Earth at 530,000 km, one week after its discovery by an amateur-run sky survey in Spain. This is (or rather was; the optimal visibility was yesterday, with 13 mag. as compared to 14 mag. now) the best NEA Earth visit in several years, and the object has been observed a lot in the past days: Of particular interest were strong brightness fluctuations every four minutes, due to the - probably non-trivial - rotation of the elongated body. • This is a NEA visit worth of some headlines, but most aren't as small ones come close all the time. The November visit of big 2005 YU55 is a different case, of course. • An asteroid on a long-lived horseshoe orbit 'around' Earth has been identified (another and another press release; some coverage here, here, here and hier. • A story on shady meteorite deals [alt.] has been attacked. • And yet another U.S. fireball that may have dropped. Comet C/2011 C1 (McNaught) looks like a tiny Hartley 2, making it interesting for photographers: April 10 [alt. ], April 5 and April 3 pictures. • The expectations for comet C/2010 X1 (Elenin) are still not clear (another and another story, a light curve with Russian debate - and it won't destroy Earth ...). • New comet C/2011 G1 (McNaught), more on the funny Holmes paper (more and more), a page with light curves and a paper on main-belt comets. Great - literally! 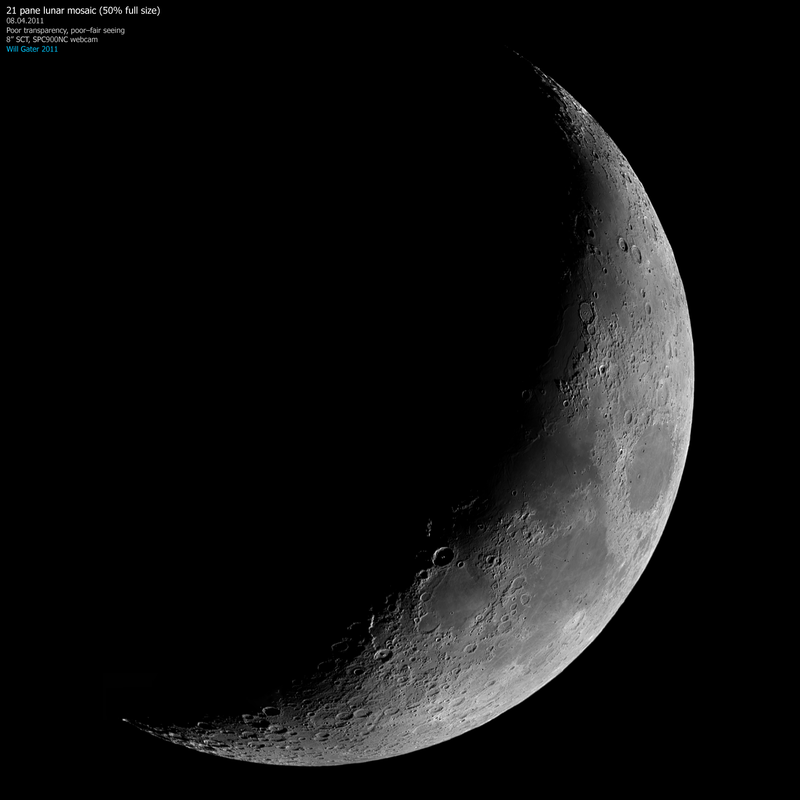 - Moon mosaics of April 10 (also 2 details by someone else), April 9 and April 8, the young crescent of April 4 from Germany (more) and Portugal, plus the waning crescent of March 3 from Cairns. • The Jovian moons in SOHO's view (animated; STEREO had a better view in the past). • And Saturn on April 3 and - hold your breath! - March 28! More action on the Sun on April 11/12 (CME video), April 11 (H-Alpha edge), April 10 (hi-res mosaic; also a detail; the fish was gone soon :-), April 6 (prominence video); also various April prominences, a March SDO timelapse movie and March 21 H-Alpha hi-res views. Plus the general rise in solar activity, and the little ice age. • Lots of solar eclipse stories in the Feb. 2011 Practical Astronomy, a great totality earthshine from 2008 - and total eclipses of the next 50 years in one map. T Pyxidis is in outburst, the first time since 1966 (more, more and mehr). • The brightness of Eps Aur is rising steeply now (also the 8th newsletter). • Also stories on SN 2011az and the Z Cam campaign by the AAVSO. • And an article on a Deep Sky meeting in Linz. A collection of great aurora pictures from the AuroraMAX camera system (discussed here), an aurora timelapse from an airplane (discussed here) and yet another aurora video. • Without aurorae night timelapse clips from India and South Dakota. • And the analysis of the Iceland volcano ash [Deutsch] over Europe a year ago.